Video copyright Sandals Beaches Resorts. 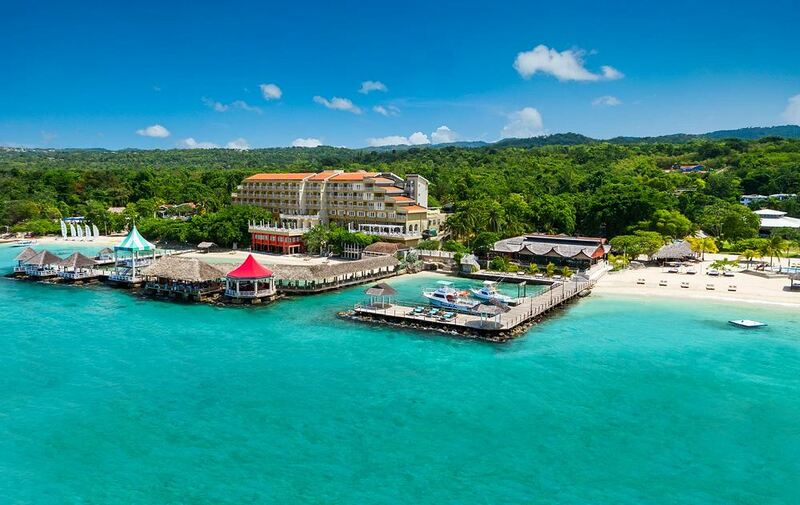 No place embodies the soul of Jamaica like Ocho Rios. Wrapped in the lush beauty of rolling mountains, meandering rivers, cascading waterfalls, and a picture-perfect coastline, Ochi—as 'those in the know' call it—inspires those who seek out its adventurous spirit and chic attitude. Everything along the Caribbean Riviera has been designed to bring the outside in, starting with the brand-new Sundowner, the chicest rooftop lounge offering full-service bar and a stylish outdoor fireplace with a bird's-eye view of the spectacular sea. Walk directly from the ocean into the casually elegant Ocean Bar, where the game is always on and the drinks are on the house. Tucked into the rolling hillside of the St. Ann Mountains, the Riviera Villas have always been the preferred romantic escape for those who desire a more serene and private setting. Now Sandals has elevated this coveted hillside experience even further, transforming it into an All-Butler Village, an exclusive retreat boasting both private and semi-private villa pools. Each and every room at the All-Butler Village includes a detail-savvy butler who will grant your every request, whether arranging romantic candlelight dinners on your verandah, or reserving a table for two at the hilltop restaurant created just for Butler Village guests. Within this rarefied enclave, you'll bask in the satisfying sense of entitlement you so richly deserve. With 16 extraordinary restaurants offering tantalizing temptations, deciding on dinner just might be the most difficult part of your day. Impeccable service, mouthwatering international cuisine, and a romantic atmosphere make every dining experience feel like a vacation. With chefs known for their authenticity and dedication to detail, you'll enjoy the same extraordinary culinary experience you'd expect in the most acclaimed restaurants around the world. And accompanied by the renowned Mondavi® Wines, every meal becomes a celebration of your love at Sandals Ochi. At sea or on land, at Sandals Ochi, you'll find your perfect level of adventure as often as you wish, because everything is included in your vacation – even unlimited scuba diving in waters renowned for being among the world's most spectacular. Swim, sail, snorkel, or just relax by the pool. Do some yoga, Pilates or get in a workout at the state-of-the-art fitness center..or hit the court for a game of tennis. You really can do it all, because it's all included. Of course, you can choose to do nothing at all. After all, it's your vacation. Free Wi-Fi in all rooms. Unlimited Devices. Pros: This resort is very lively and lots of things going on. I priced you a Riviera Beachfront Club level room. The benefit of having club level is that you get room service included. The price without air on this room is $4165.00 Includes all food, drinks, non motorized waterspouts. This Resort has a golf course and golf is included. They do require a caddy but cost is minimal. Cons: The only negative about this resort is that the beach is fairly small cove shaped.